Lumparump is Chewbacca's son from the Star Wars Holiday Special. 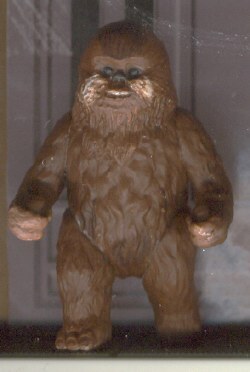 Lumpy was made from a Wicket figure from the Princess Leia collection. First I removed the head from the body. I cut off the ears and trimmed off the square edges of the ewok's cheeks (look at the figure & you'll see what I mean). I then used Sculpey to make a "mane" on the Ewok body. This gave me a starting point for the head, and also lifted the head up from the body to give him more of a neck. I then stuck the shaved down head on the "mane". I then took more Sculpey and formed the rest of the "mane" on the neck and filled out the top of the head. I also used Sculpey over the mouth of the ewok to give him more of a chimp look. Once the Sculpey cured (by boiling the figure), I painted the figure brown. I then dry brushed some white paint on the cheeks and some dark brown on the forehead. Once the paint dried, I finished him off with Testor's dull coat.